CHM files on network drives? HHReg was a utility to register HTML Help (.chm) files on an individual Windows computer to make them available for viewing across a local network. However, this patch that HHReg applied to the Windows registry, works on 32 bit Windows systems only. Since 64 bit Windows versions are common, this old tool cannot really help anymore. 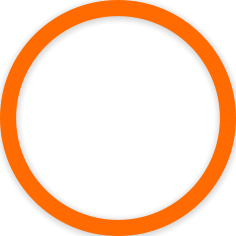 If you need it, you can still download it below, and it is still free. Just keep in mind: it doesn't work on 64 bit Windows systems. On 64 bit, there is no known workaround for the problem, that CHM files cannot be viewed across a local network. 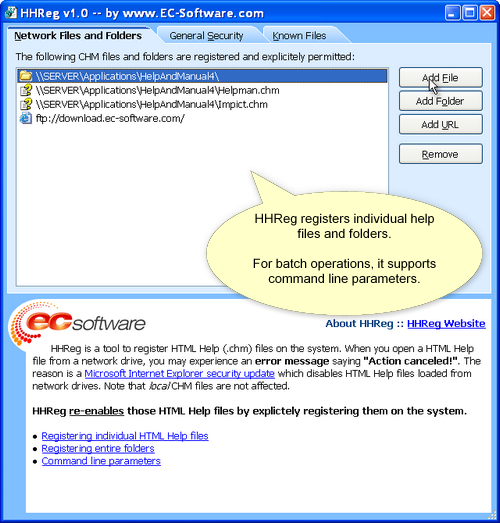 HHReg is a utility to register HTML Help (.chm) files on an individual Windows computer to make them available for viewing. Registration for HTML Help files is required since Microsoft issued a security patch for Microsoft Internet Explorer, disabling in general all HTML Help files that are viewed from a network drive. HHReg removes this limitation by explicitly registering HTML Help CHM files in the Windows registry, making them available for viewing even when opened on network drives. 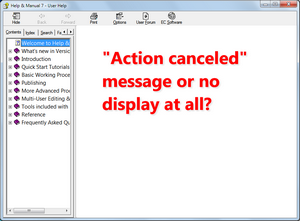 The HTML Help viewer has canceled the display of the help file due to security restrictions. This will happen with all HTML Help files that you open over a network connection (note, that local HTML Help files will not be affected). This used to work before! Why doesn´t it anymore? There are several ways to fix this problem. The first (and this is the way recommended by Microsoft) is: put the CHM files onto the local harddrive. Files viewed from local drives are not affected. If this is not possible or not desirable, you can explicitly register individual help files and folders to allow viewing them over the network or edit the Windows registry to make the security settings less strict in general. Microsoft describes the necessary steps in detail in this knowledgebase article KB 896054. HHReg helps you with the registry editing task. Modifying the Windows registry is tedious and error-prone. HHReg provides a simple user interface to view and modify the list of registered HTML Help files and folders. You can register your individual .CHM files or the folders containing your .CHM files. This does not compromise security since the registration is only applied for the specific folders and/or files you select. Please contact your system administrator first! All registry modifications require administrator rights on your PC, whether you do it manually or with HHReg. HHReg is a small and self-contained tool, just one EXE file in a zip archive. It runs right out of the box and does not require installation. E.g. you can run it from a CD Rom or from a server location to perform automated batch registrations of help files on multiple client PCs. HHReg is free for private and commercial use. 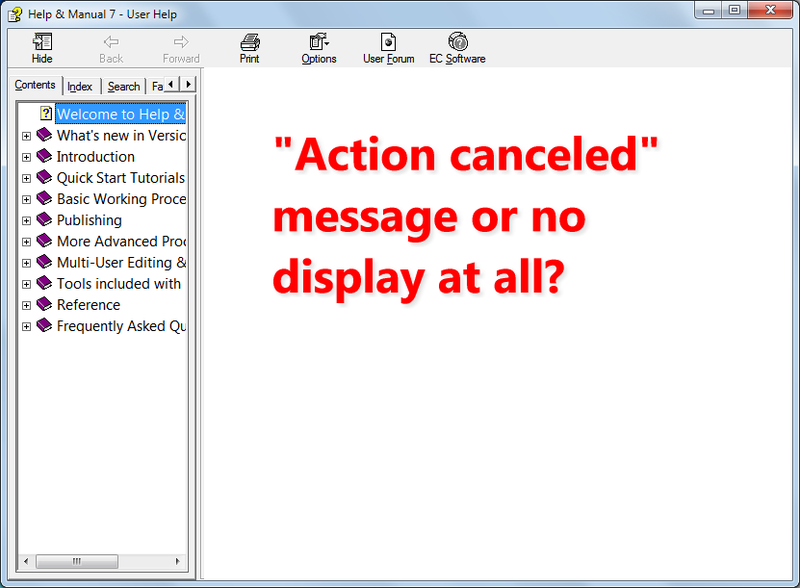 This utility is provided by EC Software GmbH, the makers of Help+Manual. * You may install and run HHReg on any number of computers to register HTML Help files in the Windows registry, either in user-interface mode or in an automated batch mode. * You may re-distribute HHReg at no charge, stand alone or with your own software to register HTML Help files in the Windows registry on client computers, either in user-interface mode or in an automated batch mode. * You may not reverse-engineer, decompile, or disassemble HHReg, except and only to the extent that such activity is expressly permitted by applicable law notwithstanding this limitation. * This is free software! You may not rent, lease or sell HHReg. NO LIABILITY FOR CONSEQUENTIAL DAMAGES. We are not responsible for anything. To the maximum extent permitted by applicable law, in no event shall ECSoftware Corporation or its suppliers be liable for any damages whatsoever (including, without limitation, damages for loss of business profit, business interruption, loss of business information, or any other pecuniary loss) arising out of the use of, or inability to use, this software product, even if EC Software GmbH has been advised of the possibility of such damages.